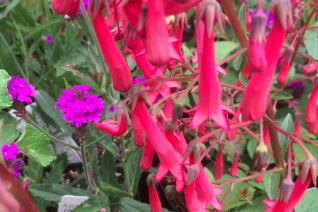 We selected this Cape Fuchsia for its compact habit and profuse display of pendant soft yellow to orange to red tubular flowers. To 3′ x 4′ and spreading it begins blooming in May and continues through September. Removing spent flower spikes will encourage more. Full sun and rich, moisture retentive soil for a plant that needs room- spreads underground by stolons. 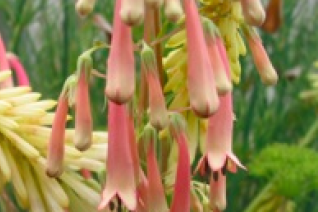 Do not plant delicate plants in the vicinity of this perennial, instead match vigor with vigor. Light summer water to none when established. Though water enhances bloom. Loved by hummingbirds and pollinators too. Great landscape plant. Cut back hard in mid-spring to refresh the plant and spur new blooming wood. Semi-evergreen.